Our printer recently died and HP told us that it could not be fixed. They offered us an upgrade at a lower price. I checked out Amazon and it was a lower price than they could offer. Our new printer came very fast and I was excited that I can scan, copy, and print from one device. But who knew that the ink would run out so quickly. I have been buying ink every few weeks! 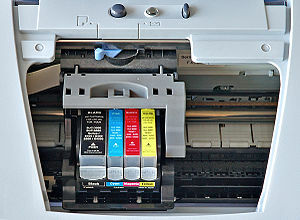 Here are my tips for saving as much as you can on printer ink. 1) Print in draft mode as much as possible. This will limit the amount of ink used on each printout. Print your coupons in black ink instead of color to limit your color usage, too. 2) Buy ink online whenever you can and be sure to compare prices with your local stores so you know when you have found a good deal. I often can find my ink for $5 – $10 cheaper than in stores. I mostly purchase through Amazon, so that if I need to return the ink, I have a reputable company to make sure the return goes well. 3) Buy remanufactured ink when you can, but be sure to check the reviews for that company and product. Some remanufactured inks are not as good as others. I have read many reviews of products that did not last long or didn’t even work when they were first opened. 4) Check reviews online for your printer ink. I almost bought a set of three colors and black ink together. By reading the reviews I found out that the four-packs for that ink number are only available as the setup packs that the printer comes with. 5) Buy XL inks when you can. These have more ink for the cost. However, be sure to read the specifications for these. You printer may take that number model of ink, but not the XL version, as mine does not. 6) Get your ink refilled at an office supply store when possible. Many inks can be refilled for a minimal cost instead of being replaced. See what your local store provides.